So after my last post, the next day I was ready to make some calls. I had cleared the plate. I had time. 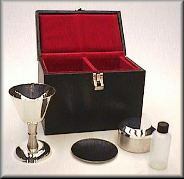 I had my brand new very kewl communion kit ready for its maiden voyage. The weather was nice. It was a perfect day. I even had a chiropracter appointment so that I was “well adjusted”. Things looked just right. After my appointment I got into the car to go make my calls. I was stuck. Paralyzed. I stared at the steering wheel for 20 minutes, willing myself to go give the Sacrament to these people who are waiting so patiently for it. I prayed. I berated myself. I tried to talk myself into it being “no big deal”. Nothing worked. My hands wouldn’t leave the steering wheel to start the car. Eventually I can to the realization that this was not going to happen that day, so I drove to a wifi coffeeshop to waste an hour and a half before I had to pickup my kids. There I sat, feeling horrible for being such a lousy pastor. Who can’t even go see their shutins? I don’t even have that many, and they are all really quite pleasant (not always the case, to be fair). Blech. I hate that. Depression can stick you into places and situations where you really don’t want to be. This is a prime example. Sometime you can’t do the things you want or even need to do. You just can’t. Call it a mental block, a massive energy drain, I don’t know. But this has been my experience with certain events with great consistency. If you can’t do something, you can’t do something. It’s that simple. It’s not a matter of sin, failure, dislike for people, or whatever. You just can’t do it. Most people will understand, and for the some that don’t, there is nothing you can do about it. So don’t worry about them. Christ fulfills His Office through the weaknesses of His pastors. In other words, even if your shutins have a drought of the Sacrament for a time, they are still being fed the Word of God, and Christ remains with them. Be of good cheer, my friends. Our Lord, who will not abandon you, will not abandon those whom you serve. No matter what may come. I can relate! You describe this stuff well. It is valuable to me. Thanks. You have been prayed for this morning. Sitting and staring seem to be activities that I find myself doing a lot. The guilt that always accompanies is usually more paralyzing than the depression itself – at least for me. Thank you for the encouraging words. I will press on.